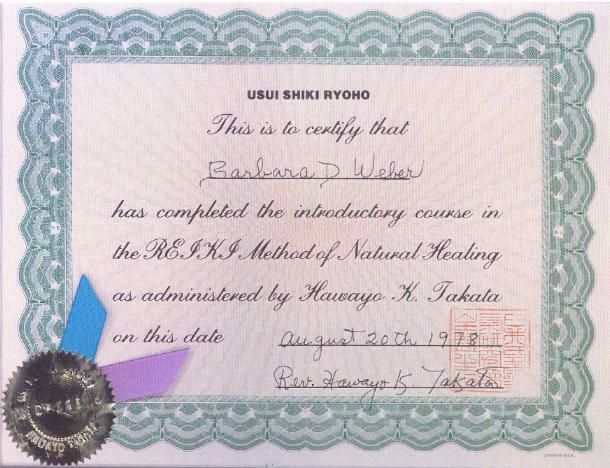 From 1978 - 1980, I had the honor of studying Reiki extensively with Hawayo Takata in her private home in Iowa. In the following article, I have written about some of the aspects of the profound relationship that existed between Takata and myself, and the depth of her Purpose in protecting the Intact Keys to the precious treasure known to her as Reiki, Usui Shiki Ryoho, as the Reiki Method of Natural Healing, as the Usui System and as the Usui System of Reiki Healing. During these extended times with Takata, she instructed me in the entire, intact Seven Degrees of the Usui System of Natural Healing, Reiki, and passed the complete Keys to me. As taught by Takata, Hyashi and Usui, the only way to activate and transmit Reiki is through the correct, intact and non-polluted Keys. Please note also that the Usui 'Reiki' Keys have never been passed according to lineage which is defined as one's ancestors and family. The process has, in fact, been one of succession defined as a process of following in order. In this sequence, Dr. Jujiro Hyashi was Dr. Makao Usui's successor, Takata was Dr. Hyashi's successor and Dr. Barbara Ray is Takata's successor. Please note, Takata did not register any of these names, and she granted to those she instructed the rights to use all these 'Reiki' names. Through many decades, the widespread use of these terms has put them into the public domain. In considering the evolution of The Radiance Technique®/Authentic Reiki®, you find that the term rei-ki is actually two distinct Japanese words combined to denote the cosmic energy science rediscovered in ancient texts by Dr. Mikao Usui. 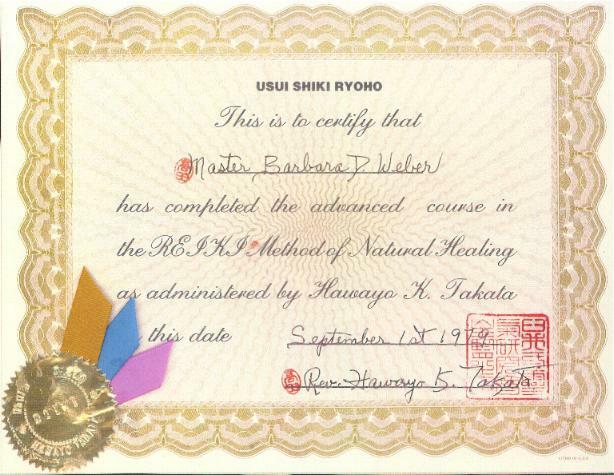 Please note that there is no actual proof , just legend, that Dr. Usui called this science "reiki". 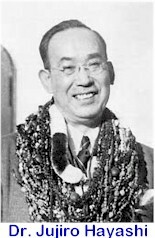 He predated Mrs. Hawayo Takata by many decades. However, "reiki" is the term used by Mrs. Takata and she explained to me that rei refers to Cosmic, Universal energy and ki refers to the life energy of the physical, outer bodies ( the three outer planes ). By joining these two words the term reiki conveyed the concept of the energy of "The Whole " and the aligning of the part (ki) with Whole, Cosmic, Universal (rei) in an ever-expanding principle of dynamic interaction and evolution. In 1983, I published the first-ever book on this science of Transcendental energy , The Reiki Factor. 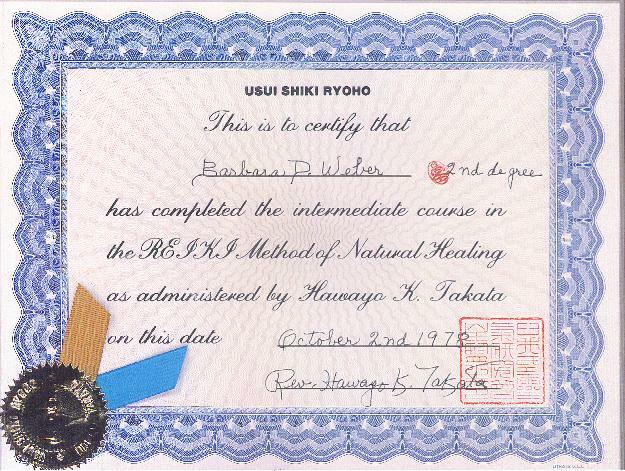 In that book, reiki was used as a verb, as an adjective and as a noun , as the name of the science and as referring to the uses of this technique as well. However, since that time, the word reiki has been used in such generalized, vague and incorrect ways that by necessity in order to protect and denote the authentic, intact science and technique new terms are now used and have been registered in many countries. Simply a generic term, reiki can be used by anyone for anything. Since it had been widely used as a generic term, it was not possible to register it... that would have had to have been done by Takata many years ago. The Radiant power of this science is accessed and transmitted through its inner-connected system of universal symbols and Attunement Processes, not by saying the word reiki or any word at all. The Radiance Technique®, Authentic Reiki® and Real Reiki® are the main terms registered now in the necessity of denoting and distinguishing, from "whatever reiki things", the intact and complete Cosmic energy science rediscovered by Dr. Usui. The entire system was passed intact from Usui to Hyashi to Takata and, then, to myself in 1979. Since that time, the use of this technique, now known as The Radiance Technique®, Authentic Reiki®, has grown and spread into a world-wide outreach encircling the globe. Now, in this book [The Authentic Reiki® (Das Authentische Reiki), Der ,Reiki' Faktor in Der Radiance Technik® by Dr. Barbara Ray, translated into German by Margarete Keppel and Ulrike Wolf, 1995] I have used the phrase 'the Reiki factor' using the word Reiki not to denote the system itself, since that is no longer possible due its widespread misuse but in a phrase referring to the factor, the component of Radiant, Transcendental, Pure Light energy which is the Inner Essence of this science. 'The Reiki Factor' – that is, the factor of the vibration of Radiant, Transcendental Light – is that which is accessed directly by means of the unique interacting from the interior of the component parts functioning within this system. The complete science is written in the language of Universal Symbols which transmit through vibration "knowledge" of the Transcendental Planes . The various Attunement Processes within this energy science are composed of these Symbols, which themselves vibrate aspects of wholeness. All of these parts are formed from within the interior of the Whole, and, the interior of the Whole is greater than the sum of the individual parts. Every aspect of this science is inner-connected/interconnected to the whole, intact system. The inner parts derive their special functions from the whole, not from other parts. Each of the Seven Degrees of The Radiance Technique ® , Authentic Reiki® is a subsystem within a Whole. 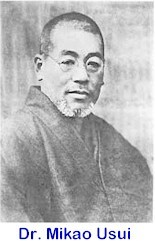 When any of the parts are used as separate from the inner-connection to the Whole system, then whatever that is becomes a mere imitation devoid of the capacity to access directly Radiant, Transcendental energy which is the inherent purpose of this system rediscovered by Usui. When you receive the intact Attunements, Transcendental energy within you is activated and when you use this technique, you are bringing this 'Reiki factor' into your daily life at any time – in any place. 'The Reiki Factor' is Universal, Radiant Light energy which is inherently harmless, benevolent and always spirals in the direction of wholing/healing on all planes of Being responding to the unique, inner needs of each individual. Since Mrs. Takata's death in 1980, extensive fragmentation, misrepresentation, confusion in thinking and lack of correct information and knowledge have occurred concerning the polluted, disconnected and partial "something called reiki " which is not at all the actual intact science that was rediscovered and passed on by Dr. Usui. Individuals who do not have access to the whole system and who do not even have knowledge of the correct Attunement Processes have been randomly "making teachers and so-called reiki masters." Using parts disconnected from the whole, intact system and inventing formulas and methods which were never related to the correct process of activating and accessing Universal energy within this system is a misguided, unfounded, irresponsible practice having no relation or connection whatever to the system rediscovered by Dr. Usui, no matter what it is called. Whatever that " something " is, it is sometimes referred to as "reiki", often with other descriptive words added and is peddled by individuals who know nothing of this incredible Cosmic science The Radiance Technique®, Authentic Reiki® Takata received from Hyashi, who received from Usui, the whole, not parts, intact Keys to this Cosmic science of Radiant, Universal energy. There are no other versions of the original Reiki and there was no split thereby creating other groups... that simply is not possible. Dr. Usui's, Dr. Hyashi's, Mrs. Takata's and Dr. Ray's Keys are one and the same : the original, intact, authentic Reiki : anything else is an imitation, a copy, a part and a fabrication . These so-called "reiki things" are parts and fragments and parts are not the whole. Indeed these very references themselves are completely dishonoring to the integrity of Dr. Usui's passing of the Real, Intact Keys. For nearly half of her eighty years, Mrs. Takata held her complete knowledge of this Cosmic Science from public view protecting it in purposeful secretiveness and silence. One must comprehend the world situation and realize that she lived a large portion of her adult life during one of the most difficult, trying and devastating periods of American and World history in the years prior to, during and following World War II. Due to the unusual context and stressful circumstances of her life, she found herself to be the living protector of this Universal energy science in an environment which made it necessary to keep secret and silent about it. She lived during a highly intense time of East-West polarities and both by her nature and her Japanese/Eastern heritage and by the prevailing winds of discord, hostilities and prejudices surrounding her entire life, she was firm in her resolve and commitment to holding her knowledge of this Cosmic science in privacy, in silence and in non-public display. What I know about Hawayo Takata is first-hand, direct knowledge from her. During the last several years of her life, I had both the honor and the privilege of being with her in the privacy of her own home, in a small town in Iowa, for many weeks of intense study and training. In addition, in August, 1980, I had the special honor of having her as a guest and teacher in my home in Atlanta for more than a month. During those private times, she intimately told me the story of her entire life and revealed the depth of her own personal trials and struggles as an uneducated woman widowed early in her adult life and as the main support of a young family. Much of what she told me was very personal and very private and will remain with me as such. From the very moment we first looked into each other's eyes , a deep and abiding special bond between us existed. This instant Heart bond sparked between us in that moment in time and has ever since and always been our Forever connection. This Radiant Love connection radiated from within encircling us in a Silent and Knowing Trust. And, it was within this intense and enlightening Radiance that she revealed the entire science, that she initiated me to all levels and thoroughly instructed me and passed the complete Keys of the intact, whole system. 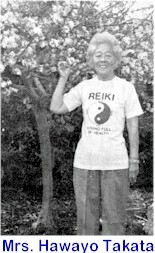 She called this Transcendental energy science "Reiki" and claimed it was passed with this name to her from Dr. Hyashi. Remember, she never knew Dr. Usui and there could be as much as nearly a century separating them. In tracing the recent history of this energy science, you must realize that Takata received all the Keys, whole and intact, in the late 1930's from Hyashi in Japan. She was not a member of his family, nor was she a native of Japan, nor was she highly educated, and she was a female and claimed to be the first woman ever to receive the complete Keys to the Seven Degrees of the authentic, Usui system. She was the only person in the West who could initiate anyone into any Degree of this Cosmic Science until the early or mid-1970's. Born in 1900, her age was also early to mid-'70's. In the few years prior to her death, she did allow a few people to teach The First Degree. However, true to her tradition of maintaining silence and protection, she did not disclose the details of the entire Usui system to anyone else, until my studies with her. Most often when she taught someone The First Degree, she did not mention that there was a Second Degree. In addition, from the very beginning of her training and teachings with me, she requested that, while she was living, I not discuss or print anything regarding the entire system, and that I not initiate any teachers. I always honored her requests and honored her as the Authority and Master Initiator. Sixteen years have now gone by since Takata's death in 1980! She had passed to me the Keys to this Transcendental, Cosmic energy science in its entirety in order to keep the continuity of making this precious science available in a new cycle and in a new context and to continue to protect, maintain and preserve this unique science whole and intact. During these years, I have been so doing. She and I had begun planning for an Association which was founded in 1980... she was present in Atlanta at the first-ever public meeting of The Reiki Association as its first and greatly honored guest. She spoke to the whole group and then spent much time graciously meeting personally with nearly all the two-hundred people attending. That association continues today known as The Radiance Technique International Association, Inc. (TRTIA). Also, she spent many days both at The Reiki Center, which I had opened in 1978, and at my home meeting more people and training two others to become teachers. She and I had begun the long process of providing for the need to train and authorize persons to teach this Cosmic science in future years and such training continues with ongoing improvements. I inherited from Takata this Universal energy science in a context and world quite different from what hers had been; likewise, hers had been very different from Hyashi's or Usui's. Each of us holding these Keys has a role in a cycle different from the preceding ones yet we are profoundly and forever connected. Each of us and those to follow is first and foremost the protector, the guardian of this intact science. Each of us must accept the responsibility to maintain this science, whole and intact, and, each of us has to struggle with many difficult issues involved in making this Cosmic energy science available and in maintaining integrity around it. Some of the main parts of my role so far have been in training others to teach , in identifying this Transcendental energy science and its link to other such sciences known on this planet from ancient times, in writing about this energy science, in lecturing and teaching in many countries to varied groups as well as privately to individuals. In addition, the gateway for the opportunity for more people to study the TRT® First and Second Degree has been greatly expanded in these sixteen years and will continue to so do. Likewise, the gateway for the opportunity for studying all Seven of the TRT®Degrees has been opened beginning another cycle. Of course there are many difficulties, many unknowns, and many complex considerations in this unfolding and expanding process involving this science requiring much time for thoughts, for reflections and, most of all, for meditations ... there are no easy, quick or superficial answers... there was no "how to" book passed, just the Keys... there are things that sometimes work and things that do not. It is an ongoing dedication to experiment and learning from what has been done and knowing when to let go and when and how to begin again... there is simply no way for me or for anyone to satisfy all the needs, demands and suggestions of everyone and there is no way "to do it all" everywhere in every country at this time in any one lifetime! Indeed, there are now and there will be others to help carry on in the years to come and to insure the ongoing continuity and integrity of The Radiance Technique®, Authentic Reiki® in the Third Millennium. In stabilizing and in expanding The Radiance Technique® in any country, it is paramount to the endeavor to distribute correct information regarding this science, to speak and to write about it correctly and to train others properly and diligently to transmit and teach about this Cosmic energy science...taking one step at a time to ensure that the foundation is steady and strong. This reminds me of the Ancient Chinese proverb "A Journey of a thousand miles begins with the first step". So, likewise, it can be said that The Journey of The Radiance Technique®, Authentic Reiki® into a thousand centuries begins with the first step. Likewise, its process of becoming available in many countries to many people represents a series of deeply significant and meaningful steps in the journey to steadiness , availability and protection of the intactness and wholeness of this Universal energy science throughout the next decades and centuries. In addition, as a unifying factor, "TRT" to designate The Radiance Technique® has been service marked and registered in many countries so that, in any language, it can become known to stand for the intact, complete, original, genuine and legitimate The Radiance Technique®, Authentic Reiki® / Real Reiki® discovered by Dr. Usui and passed to Dr. Hyashi, then to Mrs. Takata and from her, directly and in living person, to me. Copyright © 1998-2018 The Radiance Technique International Association, Inc., P.O. Box 40570, St. Petersburg FL 33743-0570. Previously copyrighted material used with permission. Last modified 2 December 1998.